2013 is a landmark year in our country’s long journey towards social justice for all its citizens: the 150th anniversary of the Emancipation Proclamation, the centennial of Rosa Parks, the Mother of the Civil Rights Movement, and the 50th anniversary of the March on Washington and Martin Luther King, Jr.’s immortal “I Have A Dream” speech. Through music, song and spoken word, Our Eyes On the Prize: King’s Dream Fifty Years On tells the story of the aspirations and setbacks, the hopes, dreams and triumphs of the struggle for human rights in America up to the Age of Obama. Created by Dr. Anthony Brown for the Asian American Orchestra (AAO) and "Voices of a Dream" vocal ensemble (VOAD), Our Eyes On the Prize: King’s Dream Fifty Years On celebrates the contributions of female freedom fighters from Harriet Tubman, Mary Ellen Pleasant and the Underground Railroad, to Fanny Lou Hamer and Ella Baker who helped organize the Children’s Campaign that transformed the Civil Rights Movement in the 1960s. This year also marks the 15th anniversary of the GRAMMY-nominated Asian American Orchestra (AAO), featuring composer, arranger, and ethnomusicologist Anthony Brown on percussion, Frank Martin on piano and keyboard, Erich Hunt on bass, Henry Hung on trumpet, Melecio Magdaluyo on saxophones and flute, and Masaru Koga on shakuhachi and saxophones. 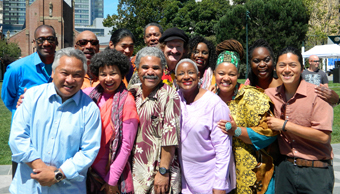 The Voices of a Dream vocal ensemble, created especially for this program, includes Amikaeyla, Terrie Odabi, Sharon D. Henderson, Deborah Tisdale, Kenneth Kozi Arrington, James “JB” Brooks and Kristina Plott Smith. Please join AAO and VOAD for what promises to be a memorable and inspirational performance!